The Fourth of July has got to be one of the easiest holidays for a vegan to navigate – even if you don’t know how to cook! 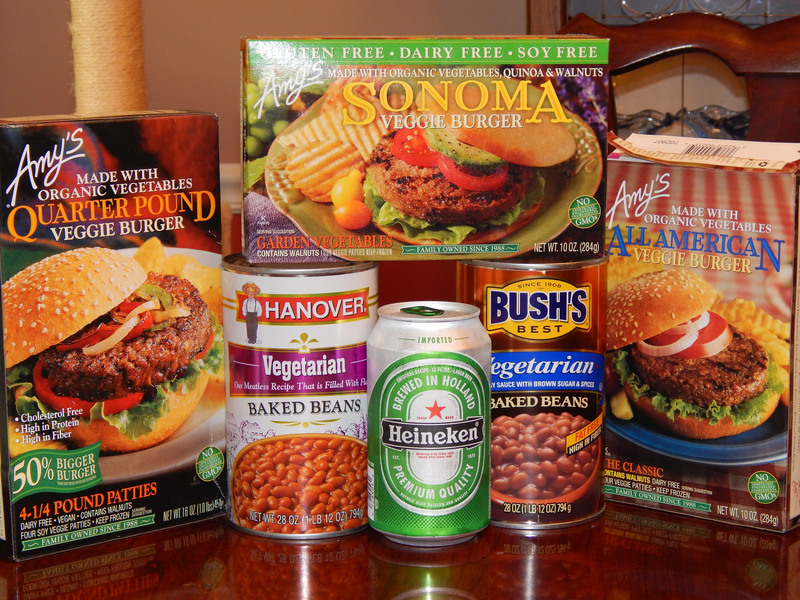 There’s a number of varieties of frozen vegan burgers and canned vegetarian baked beans. You can have a great vegan Fourth of July meal even if you don’t know how to cook! Vegetables? What could be easier than fresh, sweet summer corn-on-the-cob – boiled and then brushed lightly with Earth Balance? It’s also delicious without any “butter” at all! Or you could make skewers with chunks of red and green peppers, onions, and mushrooms and toss them on the grill. And for an easy dessert, there’s fresh watermelon. Cube it, put it into bowls, and sprinkle with fresh blueberries for a patriotic presentation. The only bit of “real” cooking you need to do for the Fourth of July is the vegan pasta salad or vegan potato salad. I’ve already shared my mama’s great dill potato salad recipe. 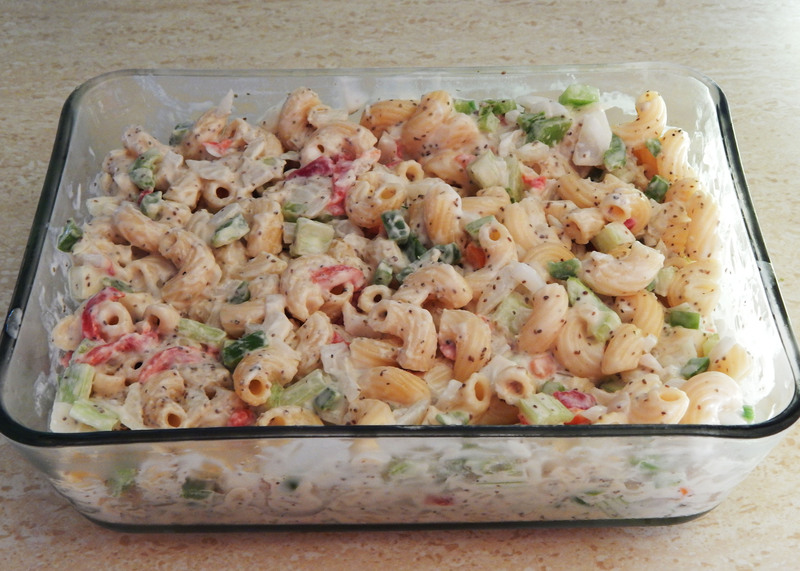 Here’s her recipe for macaroni salad. It’s a great, classic recipe with a few twists – including the Southern addition of pimentos, celery seed, and cherry/grape tomatoes. It’s easy to make – if you can slice and dice, you can make this salad! The only thing you need to remember is, like most cold pasta salads, this needs to be made in advance. It won’t taste too terrific immediately after mixing, but something wonderful happens to the flavor as it sits in the refrigerator. So be sure to chill overnight, or for at least four hours before serving. Cook macaroni according to package directions until tender, usually about 8 minutes. Drain and rinse. Pour in bowl. Add celery, green pepper, onion, and pimentos. In separate bowl, combine all other ingredients except tomatoes to make dressing. Mix well. Add dressing to the pasta and vegetables, and stir gently to combine. Refrigerate overnight, or for at least four hours. Before serving, stir in the grape or cherry tomatoes. Depending on what kind of mustard you use, you may need less salt. Some mustards are incredibly salty! For example, a half teaspoon of salt will work well with plain yellow mustard, but if you use dijon mustard you may not need any additional salt at all! The reason you add the grape or cherry tomatoes right before serving is because the vinegar in the salad tends to dehydrate and hollow out the tomatoes somewhat. The tomatoes will still taste good, but they’ll look prettier if they haven’t been chilling in the vinegar/mayo dressing. I’m not sure if we have Veganaise here in the UK. I’m not vegan, but this sounds delicious, so I assume I can just use mayo or yogurt? Mayo will work just fine – in fact that’s the way I used to make it before I was vegan! 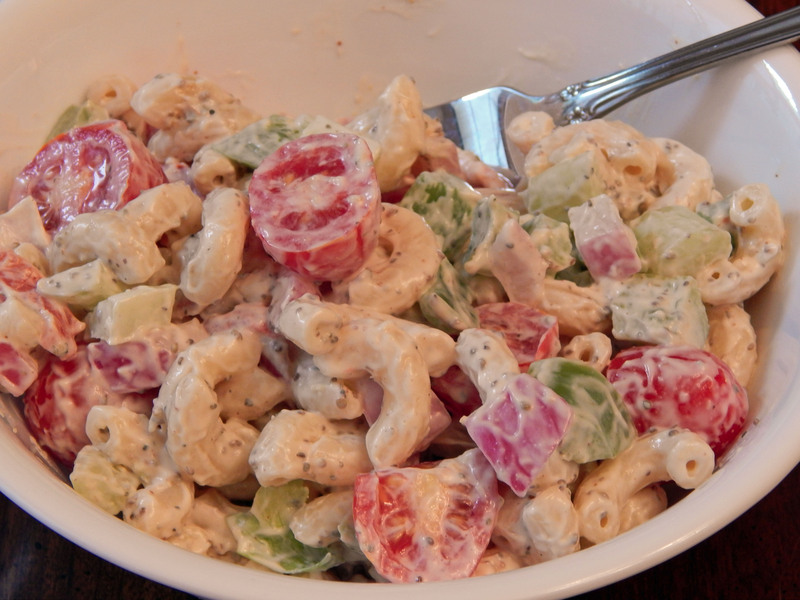 I’ve never tried yogurt in pasta salad, but yogurt will definitely work in potato salad! I am definitely going to try this, thanks! Looks good – actually, I like the watermelon and berries even better! 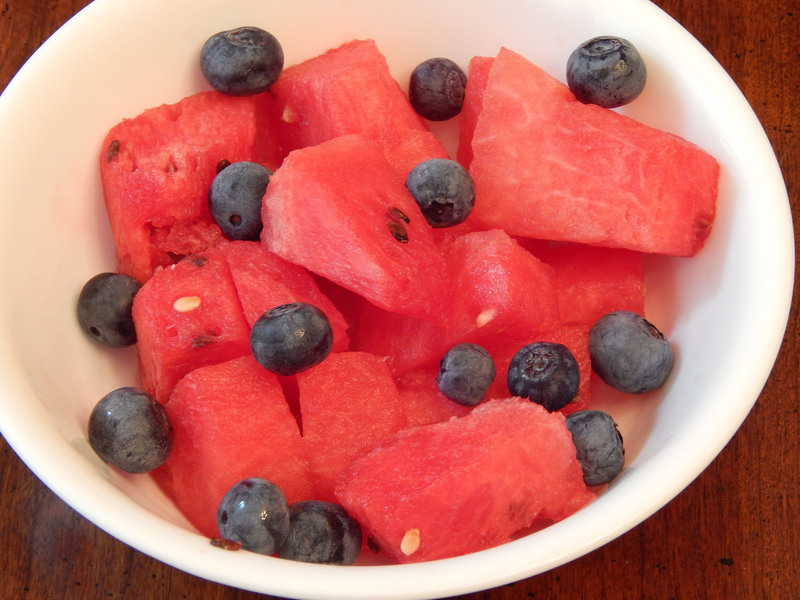 Watermelon and blueberries are an awesome combination! Easiest and healthiest picnic dessert ever. Thanks for sharing your Greek pasta recipe! I took a little stroll around your blog and your guacamole looks good, too!